It’s a privilege to camp in the desert. It’s a luxury, in my opinion, to camp where there are no showers. No RV plug-ins. No toilets. Of course, keeping these places clean means that you’d better be prepared to crap in a carry-out bag if you’re camping at Indian Creek, Utah. During the two-week trip that I recently took to Utah, I had a ton of work to do, and I needed to be in town to do it. 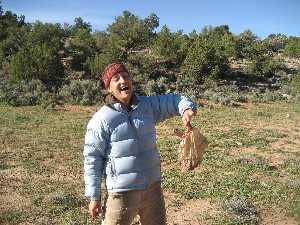 But in Moab, I get that jittery feeling that I get only when I’m that close to dropping off the grid. It’s only a short drive out of town before cell phone coverage and Internet access fizzle out, and I could feel the quietness of the desert calling like a coyote singing in the night. Right, you’re thinking. What’s so impressive about that? Well. It’s over 6-feet across, so he can sleep in it all stretched out, and he’s also welded a propane tank bracket to the back of it so that he can fuel his super-fancy heater. While I spend the mornings in my tent mustering up the energy to get my coffee going in the cold, he can just roll over and get the heater going with the flick of a switch. Spoiled? Maybe. But John lived in his van this summer, so I’d say he’s earned the break. A young woman I know is writing a book about working for a funeral home while she was in high school. “We’d pick up a body—and then go through the McDonald’s drive thru,” she told me, which I considered odd, and gross. But the thought prepared me for reading Mary Roach’s Stiff: The Curious Lives of Human Cadavers (2003), an entire book devoted to dead bodies and rotting corpses. In Stiff, body snatching, human crash test dummies, and medicinal cannibalism also make a good showing. If you’d like to add a little gore to your reading list for the upcoming Halloween holiday, this book will do the trick. I just saw it on the Barnes and Noble “paperback favorites” table here in Boulder, so it should not be too hard to find. Even though I was never able to read Stiff while eating dinner, Mary Roach proves to be a humorous guide through this strangely fascinating world. “This book is not about death as in dying. Death, as in dying, is sad and profound,” says Roach, “This book is about the already dead, the anonymous, behind-the-scenes dead.” Always respectful of her subject matter, Roach—who has a background in travel writing—launches into the particulars of cadaver research as if, I imagine, she were taking us on a tour of Paris’ art museums. Stiff is so entertaining that it must be science writing in disguise. Well-researched and academic when necessary, Roach doesn’t skimp on the technical aspects of her subject matter. 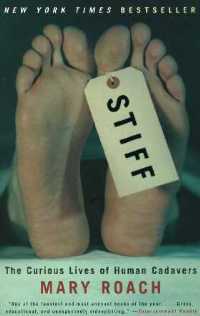 And even if you’re only slightly curious about the lives of human cadavers, you’ll still find Stiff a captivating read. There are a few stretches of road that stick with me long after I’ve left them behind. 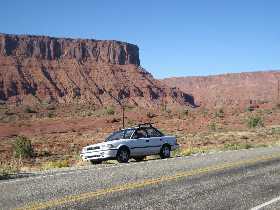 Utah’s State Route 128 from Cisco to Moab is one of them. This less-traveled road spans 60 miles, the last ten of it running alongside the Colorado River. If you’re driving to Moab from the east, don’t even think of staying on I-70 past the Cisco exit. Instead, follow the signs to Cisco (which is—truly—a ghost town), breeze on through, and soon you’ll be cruising through some of the most far-out landscape you’ve ever seen. 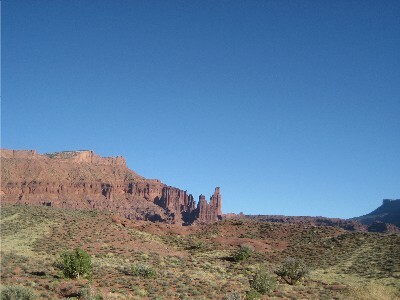 About halfway between Cisco and Moab, you’ll start passing Windgate sandstone towers. The Fisher Towers are the most noticeable—a climbing destination, of course, but also just a beauty to behold. Before long, you’ll find yourself deep in a red rock canyon, trying to stay on the road as you look up the cliffs from your car window. Two weeks ago, I took this route on my way to Moab, stopping along the way to gawk and take photos—even though I’ve driven this way several times before. 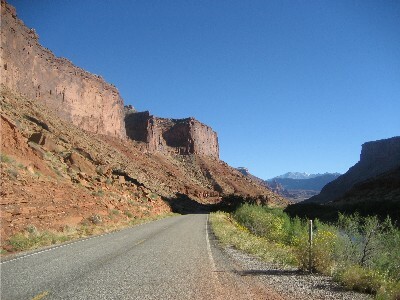 I stopped so many times that the sun dipped behind the cliffs before I got to Moab. 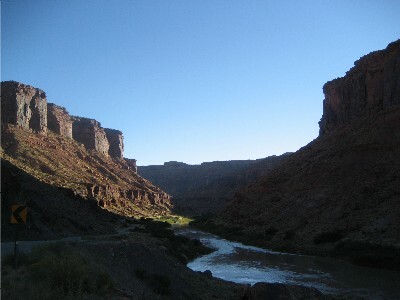 Shadows covered the canyon walls, but just moments before, the river was glittering a liquid gold. Just a bit of “Down and Out” buzz today regarding a recently published book: R.M. Kinder’s An Absolute Gentleman (Counterpoint, 2007). This novel was published at the beginning of October, but being super-eager to review anything sent my way, I received a copy of it from the Rocky Mountain News books editor in early September. What this meant was that I read the book as I’ve been living alone in the woods, or squatting in an airplane hangar (across from the county jail), or sleeping in the abandoned homes of my far-flung friends. None of this would normally pose a problem—except that the book is about a serial killer. Every little shudder of the rafters or rustling of the leaves had my heart rate spiking higher than its post-morning-espresso average. Kinder’s An Absolute Gentleman is the first book I’ve read since Dostoevsky’s Crime and Punishment that really gets at what goes on inside of a killer’s head. In the case of Kinder’s book, the murderer is a seemingly nice-guy college writing instructor named Arthur Blume. He reads loads of Faulkner. He’s classy and calm. He commits a murder every now and then. Kinder chooses to have Blume narrate the story of his own undoing, and this perspective is what makes the book work. Instead of simply following the path of an already riveting story, readers get a glimpse into the mind of a complex character in a way that an outside perspective would simply not allow. Kinder’s real-life romance with a serial killer no doubt adds to her experience with this subject matter—and it shows up artfully in her book. Kinder’s ex-husband, ironically a homicide detective, identified her lover from one of those TV shows and was the arresting officer. Seriously. Creepy, man. Way creepier than reading this book alone in the woods. If you liked Crime and Punishment. If you have a sick fascination with serial killings. If you frequently watch those unsolved-mystery-type TV shows. If you want to dive into the depths of a complex mind. Or if you just want a good, thrilling read to prepare yourself for the upcoming Halloween holiday. On December 17, 1903, Orville and Wilbur Wright made the first successful airplane flight at Kitty Hawk, North Carolina. I wonder if they even imagined what our world would be like today. Just over 100 year after the Wright brothers’ historic flight, gazillions of airline companies are carting travelers all over the world. Warplanes are dropping bombs. We’re flying for fun and landing planes in our backyards. After a recent excursion into the Boulder skies, I understand more the impulse that humans have to see their world from such a perspective. I love to travel, but I had never flown around for the heck of it. My friend Andy flies a 180-hp Bellanca Scout, a little yellow thing that’s much lighter than my beat-up Toyota Corolla. He needed to winterize it before leaving the country for six months, so he asked me if I wanted to warm-up the engine—by flying around for a bit—so that he could drain the oil. Sure! Who could resist such a venture? I’ve been in Boulder now for about seven weeks, so I’m just learning my way around, but seeing it from above helped me understand the layout of the place. I felt super-happy to see from the air that Boulder is not big at all, and nice green trees still speckle the urban space. Boulder’s my kinda place. I was pretty sure of it when I arrived, but the flight confirmed it. On the way back to the hangar (the one I’ve been sleeping in intermittently), we landed in a field behind Andy’s friend’s house. This guy ended up having a hangar attached to his house, full of antique planes. The oldest were from the 1930s, and one of them was an old WWII training plane from the 40s. Life: Let the Towings Begin. So. 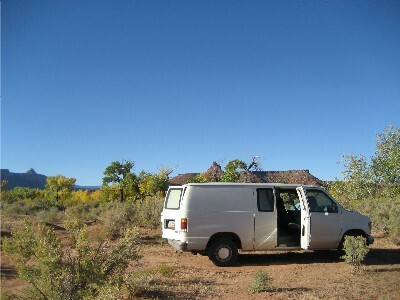 Just over a week ago, I drove out to Limon, Colorado to exhume the van. In Eastern Colorado, the wind blows hot, and the sun burns so bright that even my memories of the event are washed out. The plan was to get the van going and then leapfrog it back to Colorado Springs, me driving with a friend following in her car. I had high hopes; the Old Lady miraculously started when I went out to check on her in May, but this time, she just wouldn’t fire up. And the left front tire was flat. Again. Wade—shed owner—had his uncle come out to meet me, which was great since his family owns a towing business. 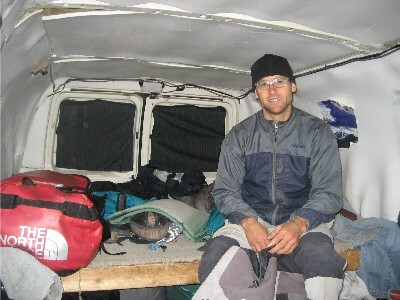 Before yanking the van out of the shed, we tried everything within our power to get it going. Neither of us being mechanics, we had flames spouting from the engine compartment when starter spray lit one of the air filters. Stressful. But nothing a few panicked screams (and some water) couldn’t fix. Based on previous experience, I knew enough to wait to retrieve the van until I had a decent chunk of money saved. I bought the thing for $1000 in 2003—and then few weeks later spent more than that replacing the engine when it blew up in the Mojave Desert. The trip to Limon ended up being less painful that I thought it would be. Only $60 for the tow to a shop, and then only $21.60 for an oil change. But I knew that the mechanic who worked on it had to do more than an oil change. He had to start it, too, and when I asked him what he did, he said that he just turned a screw or two on the engine block. Um. Maybe. The tire? Just added air. I wish that the world were as generous as that mechanic in Limon, Colorado.